If you are interested in getting behind the wheel of a sporty and fuel-efficient new coupe at an affordable price, Kia has just the car for you. 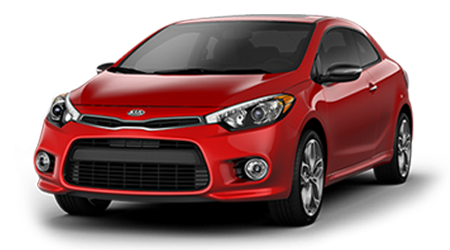 The 2016 Kia Forte Koup is the sportiest machine in Kia's Forte compact car lineup, offering not only a sporty 2-door design, but also an available turbo engine that can provide some real thrills. Kia has quite the reputation for providing the high-tech features that every modern driver wants at a price that is ultra affordable, and the 2016 Forte Koup is no different in this regard. With a starting price below $20,000, the Forte Koup is a lot of car for the money! If you are in the Lebanon, Crossville, Mcminville, Franklin, and Chattanooga area and are ready to experience this stylish and fuel-efficient coupe for yourself, visit Cumberland Kia. There you will get a detailed tour of the Kia Forte Koup, including all of the features that make it the best value in its class. Equipped with a 2.0-liter inline four-cylinder engine, the 2016 Forte Koup achieves a superb 25 city and 34 highway mpg rating, while producing a lively 173 horsepower and 154 lb-ft of torque. Those 173 horses will have no problem propelling this lightweight coupe around the corners or up to cruising speed. The top-of-the-line Forte Koup SX features a potent 1.6-liter turbocharged inline four-cylinder under its hood, developing a commanding 201 horses and 195 lb-ft of torque. What is even better is that this little turbocharged engine returns an EPA-estimated 22 city and 30 highway mpg. A smooth, 6-speed automatic transmission with Overdrive and Sportmatic shifting comes as standard on 2.0-liter Forte Koup models, while Forte Koup coupes equipped with the 1.6-liter turbo engine feature a sporty 6-speed manual as standard, with an automatic transmission as optional. No matter which Forte Koup model and powertrain you select, rest assured that you will have love its sporty and fuel-sipping nature. Kia believes in the quality and durability of every new vehicle they produce. That is why they have backed every new Kia vehicle with an industry-leading 10-year or 100,000-mile warranty program. Kia's 10-year/100,000-mile warranty program includes a 10-year or 100,000-mile limited powertrain warranty, a 5-year/60,000-mile limited basic warranty, a 5-year or 60,000-mile roadside assistance plan, and a 5-year/100,000-mile limited anti-perforation warranty. For more information on Kia's outstanding warranty package, visit the friendly folks at Cumberland Kia in Cookeville, TN. If you are ready to drive a fun and fuel-efficient coupe that will set you apart from the crowd of boring sedan out on the roads, then get into a 2016 Kia Forte Koup. Cumberland Kia proudly serves the communities near Lebanon, Crossville, Mcminville, Franklin, and Chattanooga. If you are nearby, visit our Cookeville, TN showroom and our friendly sales staff will set you up with a test drive of a sporty 2016 Kia Forte Koup.